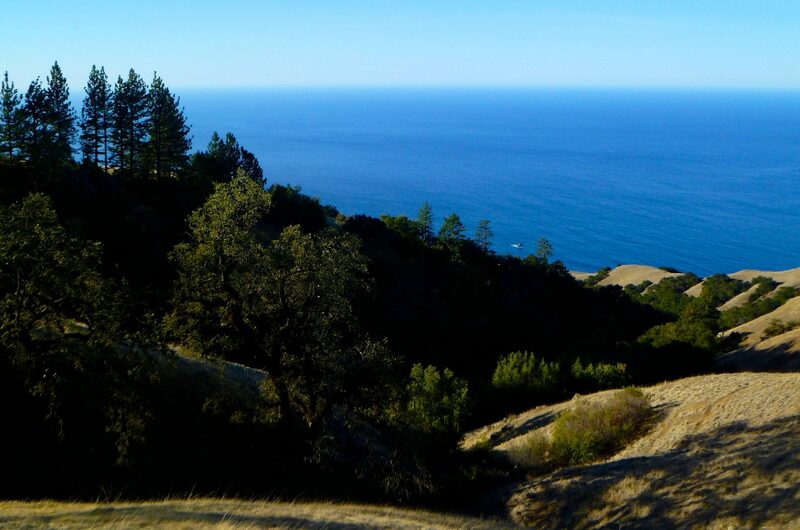 Where: Silver Peak Wilderness in Los Padres National Forest, Big Sur region of the central California coast. 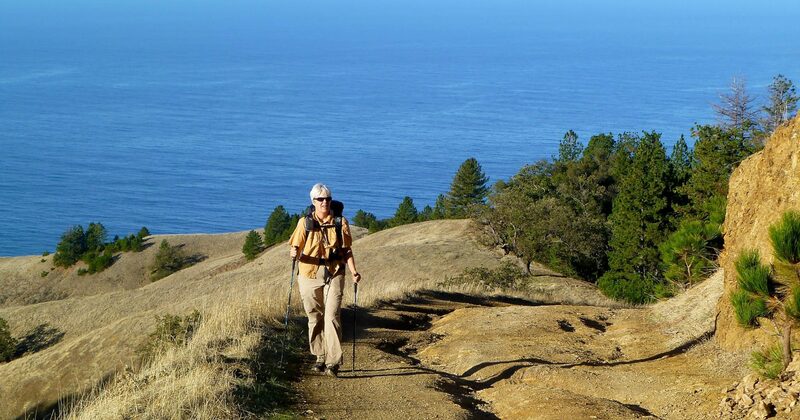 Highlights: fine ridge walking, exploring an old trail, coastal views. The Ventana Wilderness Alliance is an effective local conservation organization dedicated to protecting the region’s wildlands. Trails are not well maintained and it is critical to check the current status at the excellent Trail Conditions Reports. National Geographic Trails Illustrated Map: Big Sur, Ventana Wilderness [Los Padres National Forest] includes the Silver Peak Wilderness. 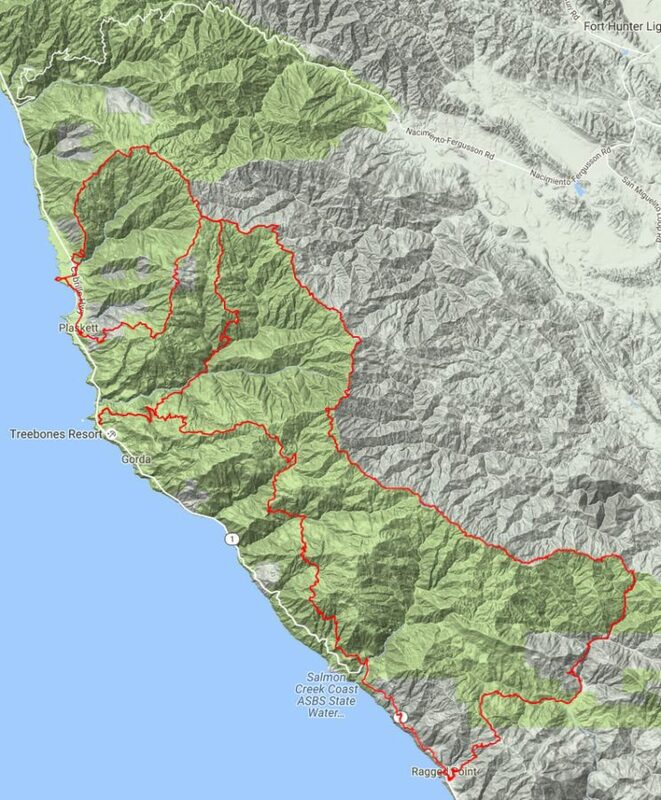 There is extensive map and gpx data available at BigSurTrailMap.net. 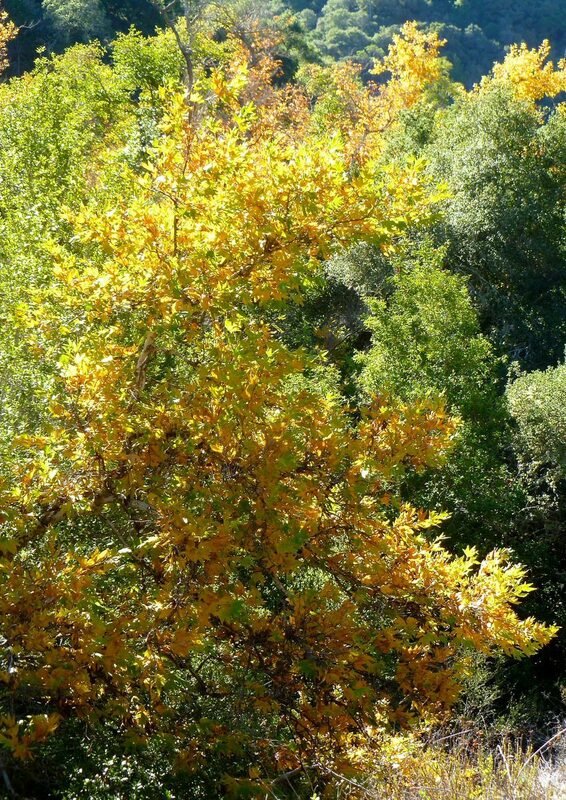 There are several trail guides; our favorite is the comprehensive and concise Trail guide to Los Padres National Forest, Monterey Ranger District : Ventana Wilderness and Silver Peak Wilderness, published by the Sierra Club. 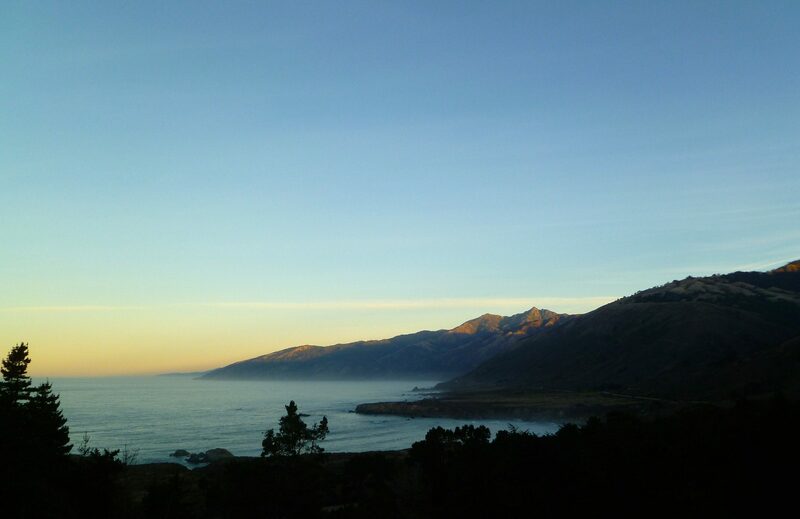 We have taken several trips to Big Sur during the Thanksgiving holiday weekend. The weather is usually pleasantly mild and clear, and the trails are quiet because most people are home eating turkey. This was our second trip to the Silver Peak Wilderness and there were some new trails we wanted to explore. We had seen map references to the possibly abandoned Lottie Potrero Trail and this intrigued us. Some research lead us to believe that while the trail was no longer maintained, it was likely to be passable. Afternoon of first day, descending a use trail from Prewitt Ridge USFS Camp to Highway 1. Morning #2. Calm, clear, warm, no fog. 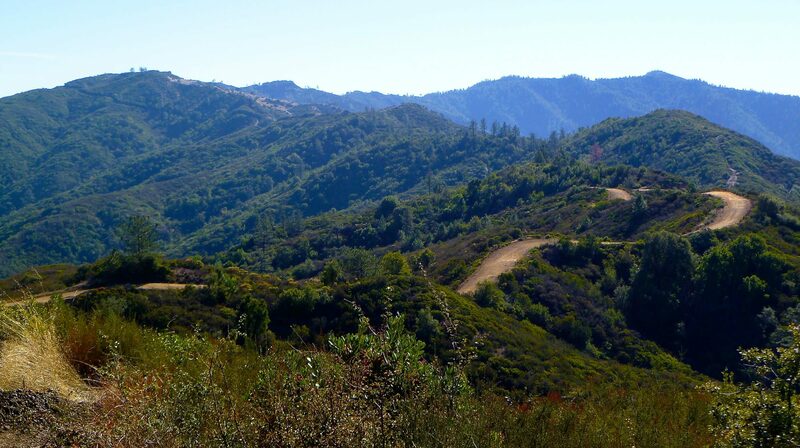 We will recross Highway 1 and climb back up to the South Coast Ridge Road via a different route. Dinner #3. 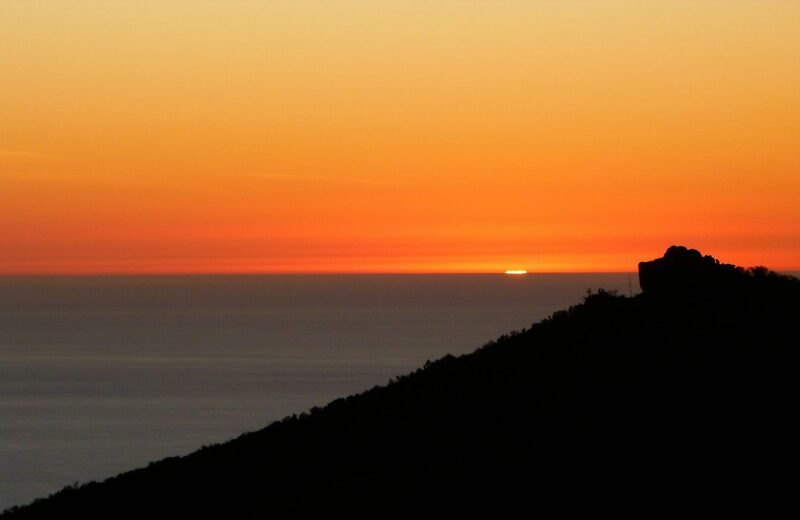 We grabbed burgers at the Ragged Point Grill, and watched the sunset from their deck. On the fourth day, we climbed back up into the mountains via the Buckeye Trail, before descending again to our car at Highway 1. 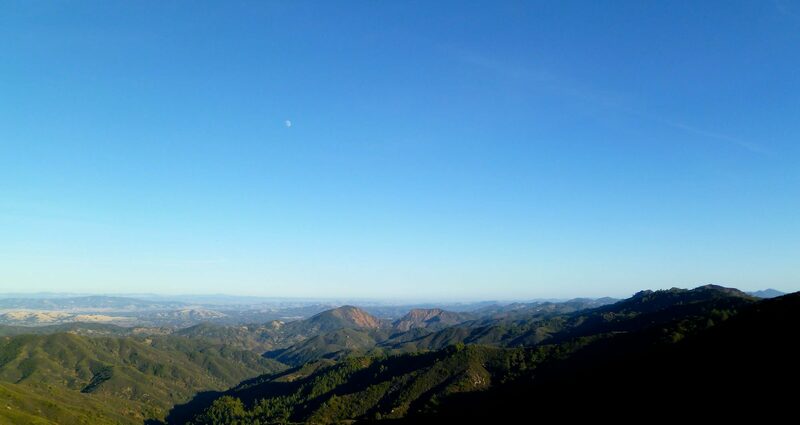 In this part of the Santa Lucia mountains there are plenty of very fine routes to climb from Highway 1 up into the mountains. Camp #1. 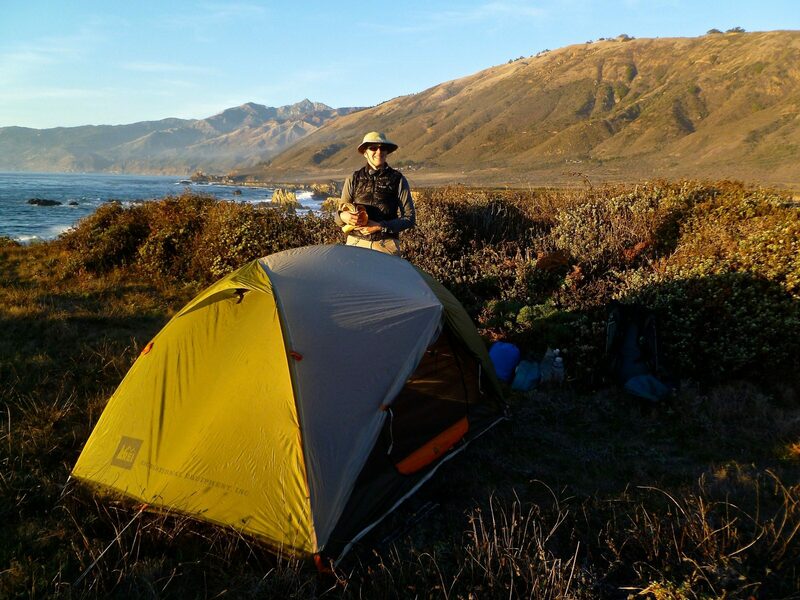 A five-star stealth camp on the ocean bluff near Gorda. 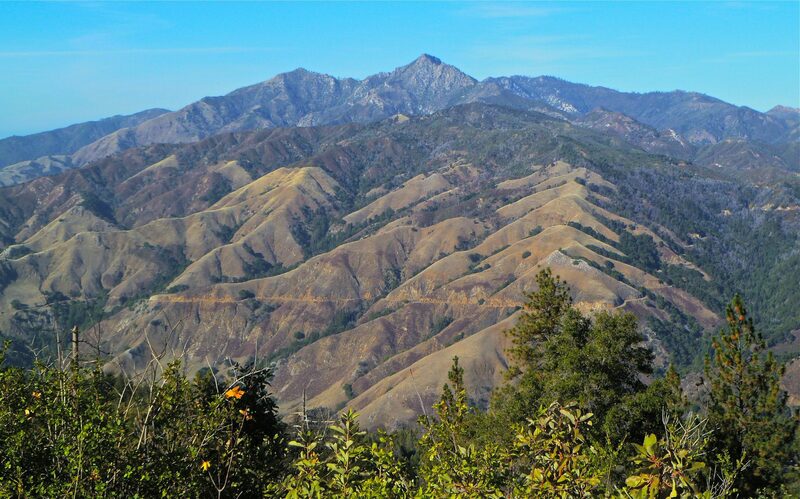 The Silver Peak Wilderness is similar to nearby Ventana Wilderness in its grandeur. Every day of this trip, like every other day we’ve spent in the region, was splendid. 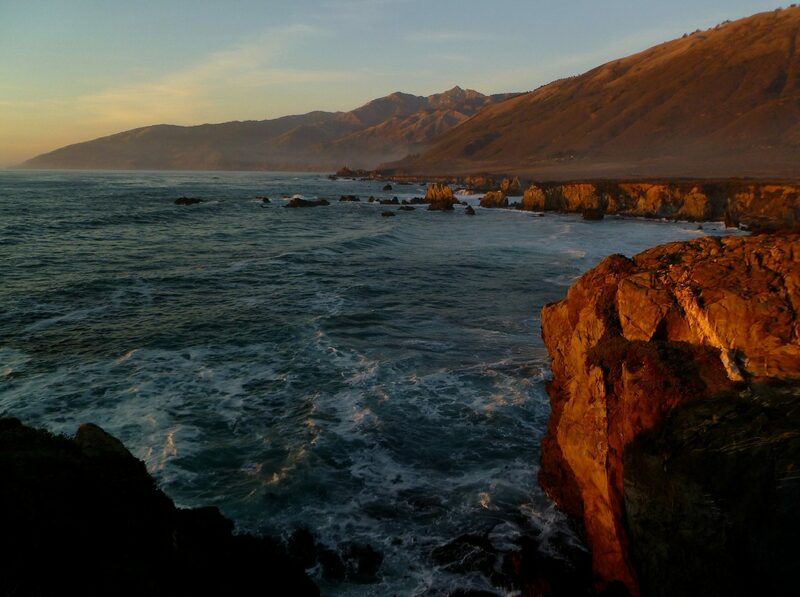 Clear mild weather, expansive ocean views, botanical diversity, very rugged terrain. 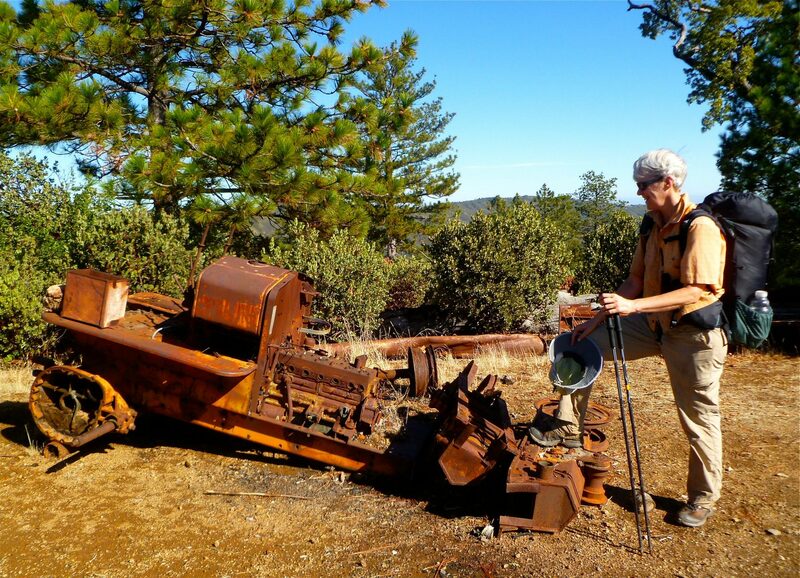 It was fun to explore new trails, and especially satisfying to find and follow the abandoned Lottie Potrero Trail. I will never tire of hiking in this region. And I love our tradition of backpacking during Thanksgiving. This was a fine way to spend Thanksgiving. We had great weather and some beautiful sunsets. I particularly enjoyed our campsite on a point overlooking the Pacific in the coastal heath near Pacific Valley. Following the old Lottie Potrero Trail added a bit of adventure to otherwise straightforward and fun walking. 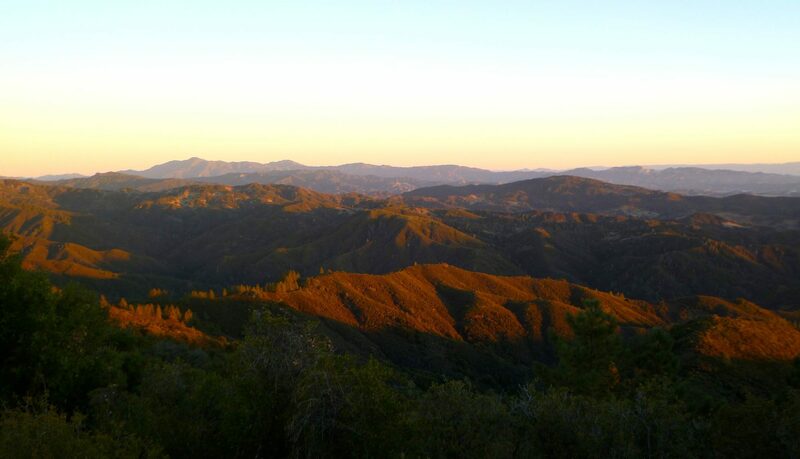 The Silver Peak Wilderness is not as well known as the adjacent Ventana Wilderness. We took many hikes in the Ventana area before we finally went further south to Silver Peak. The area is scenically fabulous and has very fine backpacking. 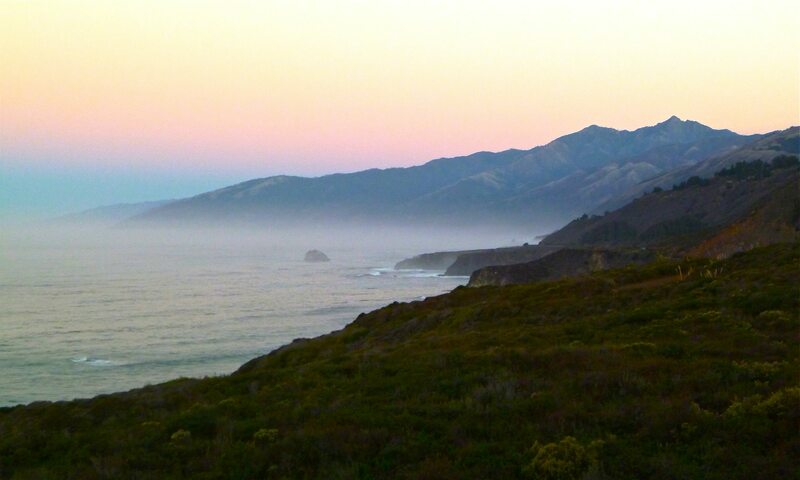 Some nice coastal walking is possible in the Pacific Valley area. 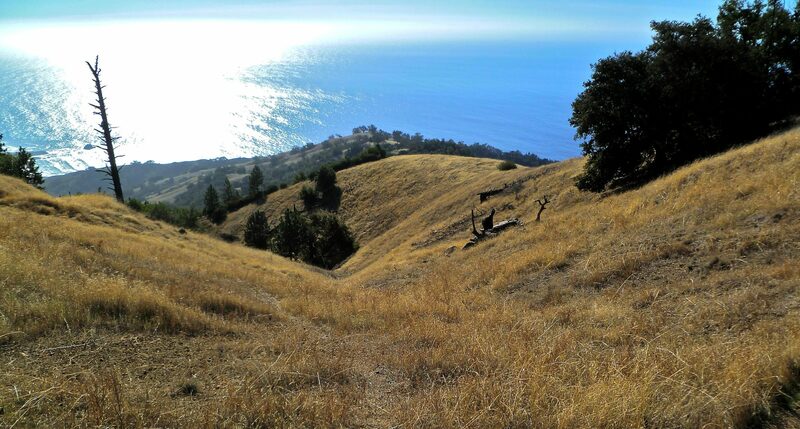 One area of interest to us was the Lottie Potrero Trail (LPT). 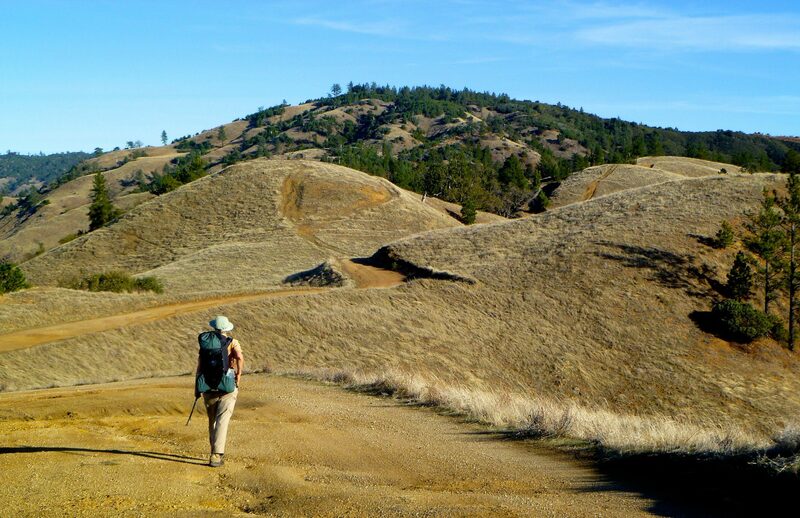 During trip planning a source of information was the excellent website provided by the Ventana Wilderness Alliance (VWA). This group maintains extensive trail status pages updated by trail users as well as large amounts of other pertinent information. Although it shows up on old Forest Service maps, the VWA didn’t have any public data about the LPT, which formed a critical link in our planned route. 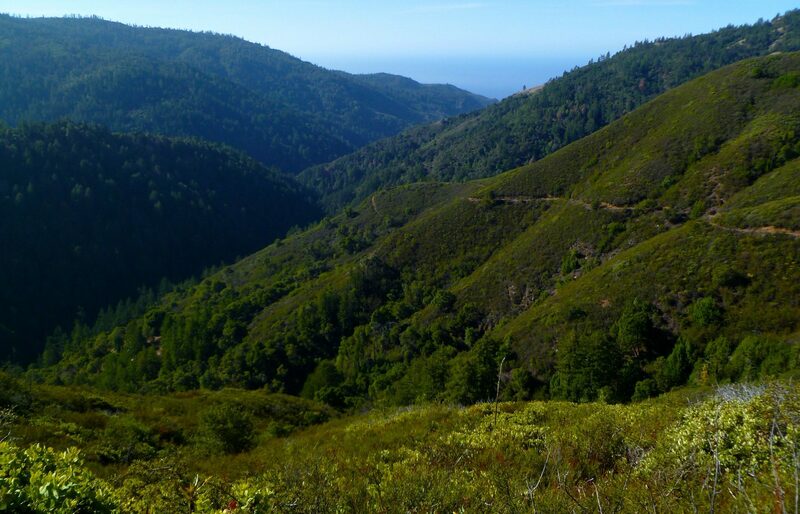 Lack of data often means one thing in Big Sur: the trail is brushed over and has been abandoned by the Forest Service. 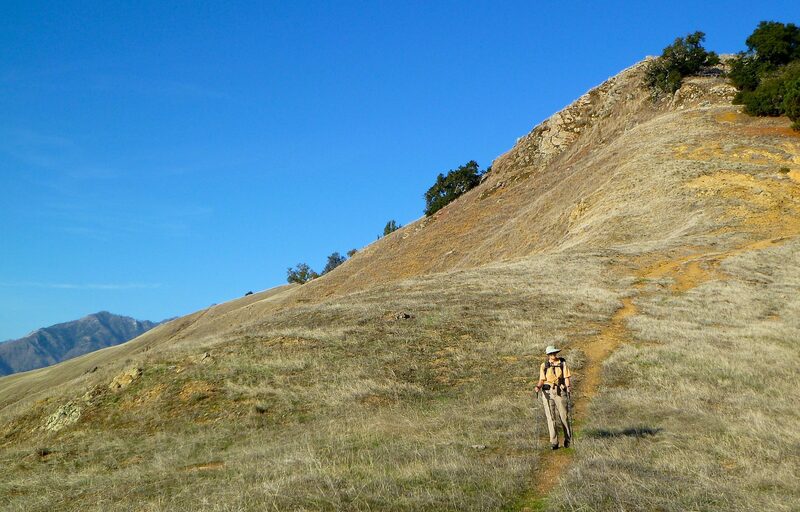 Those of you who have hiked in the Santa Lucia Mountains have almost certainly experienced how incredibly fast trails can be obliterated by both encroaching vegetation and the loose unstable soils. The Forest Service spends almost no money on trail maintenance and many mapped trails have effectively disappeared. We posted some inquiries about the LPT on the VWA and BackpackingLight sites and received encouraging and very helpful responses. These included a GPX track made by someone who had recently been on the northern portion of the LPT along with the news that, while not a wilderness freeway or marked on the ground, the LPT was mostly findable and passable. With not too much work, the LPT could be resurrected into a decent route. We wouldn’t recommend it to a novice, but the LPT is usable by experienced hikers with a gpx track in hand. The LPT descends through a fine, wild drainage and leads to some completely unexpected and lovely pocket meadows. 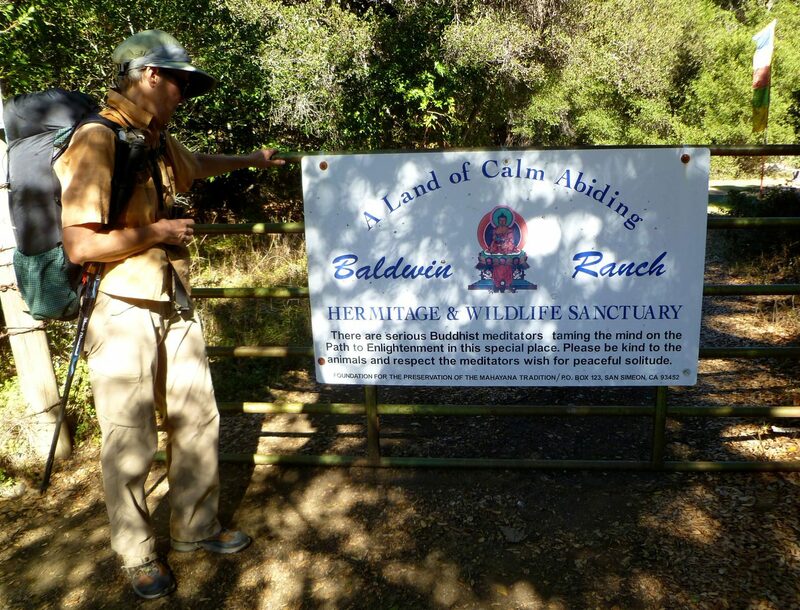 Upon reaching the Baldwin Ranch Road, the route passes through a Buddhist Hermitage, which is part of the Foundation for the Preservation of the Mahayana Tradition. We quietly and discreetly walked by without seeing anybody. 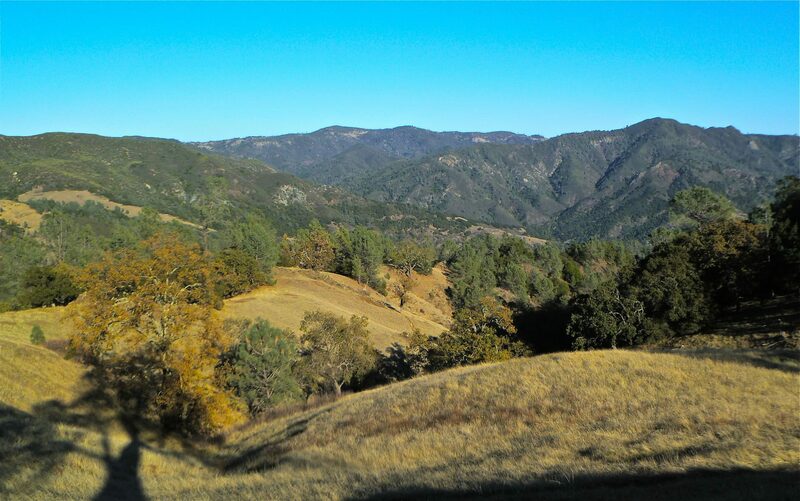 Although the Baldwin Ranch Road is publicly accessible to walkers, the Hermitage is privately owned land, and we do not know if hikers are welcomed, tolerated, or discouraged. We had to walk a couple of miles on Highway 1 to connect trails on our route. Fortunately this was at first light on a Sunday morning, so there was almost no traffic. At other times of day, the number of cars could be bothersome to some people (and potentially even dangerous), although the views from the road are spectacular. 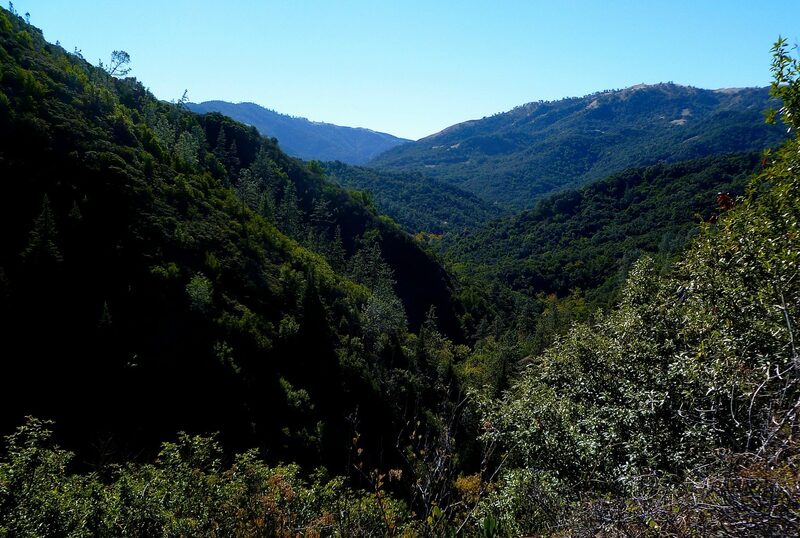 South Coast Ridge Road is a publicly accessible Forest Service road. However, we saw very few vehicles, even on a perfect-weather holiday weekend. This road was essentially dry. A lot of the hiking is on ridge tops, so finding water can be an issue. Prepare to carry a bit more than normal and be sure you know where there are reliable sources. Willow Creek Road is also a publicly accessible road, and it provides access to several active in-holdings. We saw about a half dozen vehicles while walking this road. 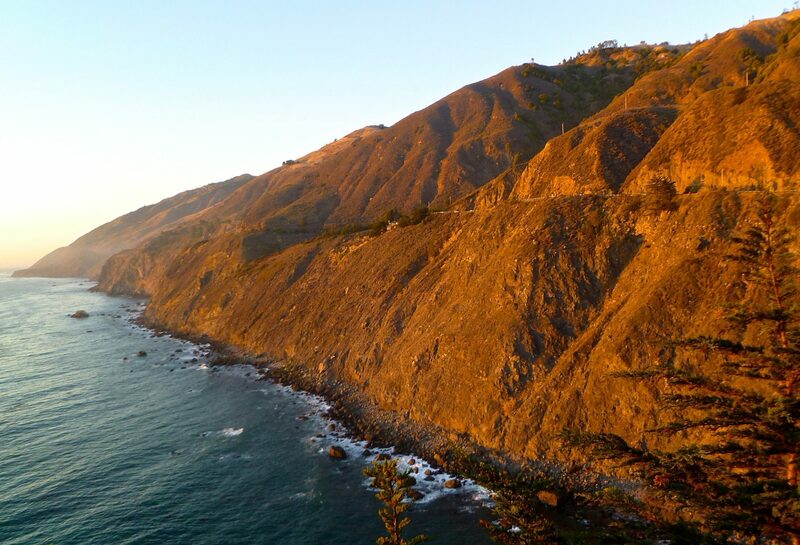 There is a restaurant located at Ragged Point on Highway 1 at the south end of the loop.